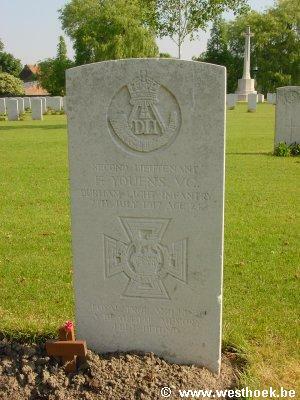 YOUENS, Second Lieutenant, FREDERICK, V C, 13th Bn. Durham Light Infantry. 7th July 1917. Age 24. YOUENS, Second Lieutenant, FREDERICK, V C, 13th Bn. Durham Light Infantry. 7th July 1917. Age 24. Son of Vincent and Lizzie Youens, of "Belgrave," 64, Desborough Park Rd., High Wycombe. Railway Dugouts Burial Ground (Transport Farm) I. O. 3. An extract from "The London Gazette," dated 31st July, 1917, records the following- "For most conspicuous bravery and devotion to duty. While out on patrol this officer was wounded and had to return to his trenches to have his wounds dressed. Shortly afterwards a report came in that the enemy were preparing to raid our trenches. 2nd Lt. Youens, regardless of his wound, immediately set out to rally the team of a Lewis gun, which had become disorganised owing to heavy shell fire. During this process an enemy's bomb fell on the Lewis gun position without exploding. 2nd Lt. Youens immediately picked it up and hurled it over the parapet. Shortly afterwards another bomb fell near the same place; again 2nd Lt. Youens picked it up with the intention of throwing it away, when it exploded in his hand, severely wounding him and also some of his men. There is little doubt that the prompt and gallant action of 2nd Lt. Youens saved several of his men's lives and that by his energy and resource the enemy's raid was completely repulsed. This gallant officer has since succumbed to his wounds.